and gives a player a score between 0 - 200.
players by their score, not age and gender, for more competitive fun. 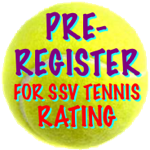 the SSV Tennis Rating System was developed 40 years ago by owner Neil Johnson. Pros, Coaches and Players use SSV as a benchmark for tennis improvement. SSV is currently being used in more than 50 clubs and venues in Southern California. Tennis is more fun when players are evenly matched! SSV tournaments are a great way to ease into stronger competition. SSV tournaments are a great way to find players at your advanced level.